If you thought the life of an eavestrough was safe from prejudice, you’d be wrong. All across the wintertime world, people look up, they see great mounds of ice accumulating behind their eavestrough, and they get mad. Who wouldn’t? Rooftop ice causes shingle damage and water leaks. It’s also dangerous for people unlucky enough to be standing around when an iceberg calves off of the main rooftop glacier and falls to the ground. All this is why people get angry at eavestroughs. When they’re covered in ice, they certainly do look guilty. But the truth is, removing eavestroughs won’t eliminate rooftop ice build up. Dangerous quantities of ice will still accumulate, even with the troughs gone. The real cause goes deeper and costs you more. When an attic is too warm in winter, it melts rooftop snow even when outdoor temperatures are below freezing. As this water runs down the artificially warm shingles, it eventually hits the lower edge of the roof at the eaves. Since there’s no heat underneath this location, the water refreezes, forming the start of what’s called an “ice dam’. After a few weeks of sub-zero weather, the thaw-and-freeze cycle signifies a great big problem. Two problems, actually. First, the formation of rooftop ice is obvious proof that you’re spending too much money heating your home. It costs big cash to melt snow all winter long, and ice dams are proof that this is happening in significant quantities. 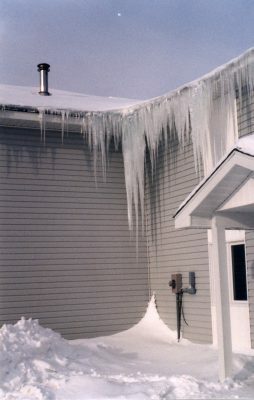 The second reason to take ice dams seriously is the damage they cause to your house. If the dam is more than a few inches thick, it can trap and hold significant pools of rainwater when things warm up during a thaw. Shingles can only keep water out of your home if it’s trickling downwards off the roof. Halt this downward flow and water seeps into your attic, through your ceiling and onto your favourite armchair. Don’t blame your roofer, don’t blame the rain, and don’t blame your eavestroughs. You have three tactics available in your battle against ice dams. The first and best is boosting attic insulation levels. Reduce heat migration into the attic from your living space, and less energy will be available to melt rooftop snow. This strategy also reduces your heating bill significantly. Another option is to prevent warm air from leaking into the attic. And it doesn’t take much of a hole or crack or gap to make it happen. Start by looking at your attic access hatch. This is a notoriously popular spot for massive air leaks into attics everywhere. Boosting attic ventilation is something else you should consider. 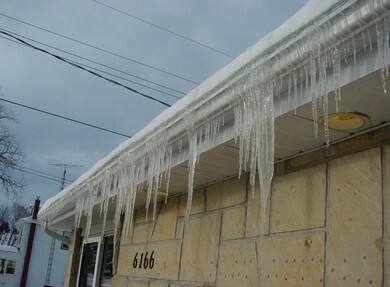 It’s not possible to insulate all types of roofs enough to prevent ice dam formation. And it can be virtually impossible to properly seal attic spaces in some older homes. This is where boosting attic ventilation is effective. If you can’t eliminate excess heat build-up in the attic, you might as well let it waft away harmlessly, before it spawns any ice dams. I’ve seen more than a few buildings that used to develop serious ice dams each winter, but now have none. The only change was an increase in rooftop vents. 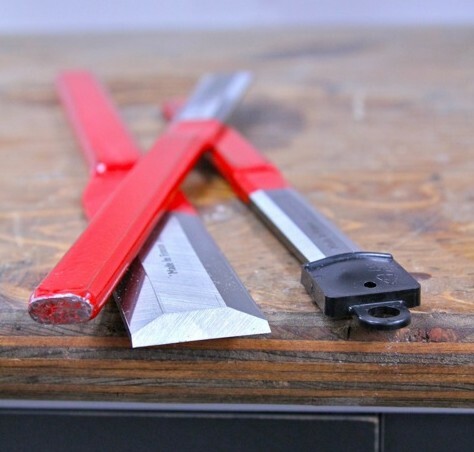 Real-world solutions like the ones I’ve mentioned aren’t always easy or cheap. Sometimes they’re not even possible in older homes because of design issues. That’s why I mention one last ice dam solution. Rooftop heating cables installed around the eaves and troughs keeps them warm enough to allow water to keep flowing downwards, even when ambient temperatures are below freezing. It’ll cost you more in electricity, but even that’s better than a soggy armchair. Is it necessary to apply a vapour barrier to the 3”-thick foam installed on the insides of concrete basement walls? How do I keep my attic cool in winter to prevent leaks?